Chef started baking pastries again (long story). The Cat picked-up some yesterday. 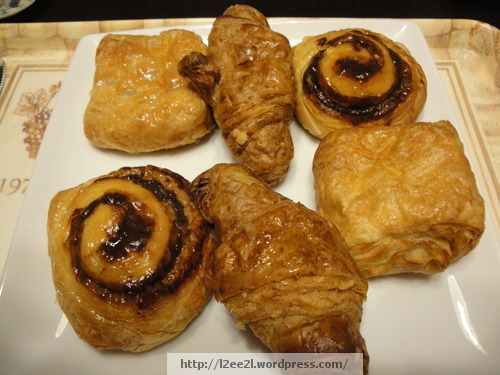 Apple danish, whole wheat croissants, cinnamon swirls, and chocolate danish. Oh happy day. 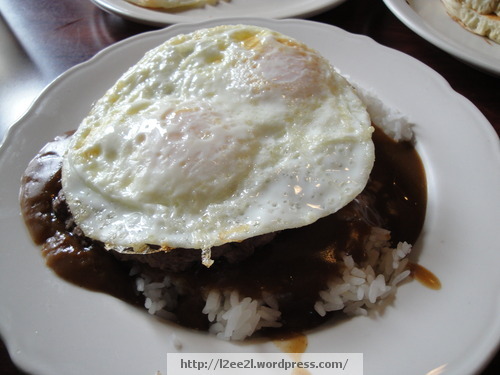 For some reason (maybe it’s the possibility of starting at a vegan raw restaurant tomorrow), I was in the mood for a loco moco today. Went to our neighborhood breakfast joint. Waitress said the gravy and hamburger patty were house-made (not frozen). Wasn’t bad, the two eggs was a plus. No worries, I had a large salad for dinner (romaine lettuce, celery, raisins, non-fat raspberry vinaigrette). I’ve been wanting to get back into a restaurant kitchen. Watching YouTube videos can only go so far. Downstairs of the chocolate shop was a vegan raw foods take-out shop. The manager used to come in twice a day for his espresso shots. Last month he mentioned that he is going to miss the espresso because the shop was moving to larger digs (they’re also opening a restaurant at the larger location). Just on a whim, I asked him if they were hiring. They are. Dropped off an application yesterday and they said to come in Monday. Now, you’re probably thinking hmm? No, I have not turned vegan, or vegetarian. But I’m open to learning new things, especially when it comes to food. I wonder if that’s the definition of a foodie? Will let you know how Monday turns out. In the mean time, used up the last of the roasted chicken I picked up the week before, only the wings were left (The Cat’s favorite section). Took a page from our Chinese chef friend. Simmered the chicken wings with goji berries and dried lemon peel. Added look fun noodles, Napa cabbage, and a little basil (jus’ cuz’ we had some). 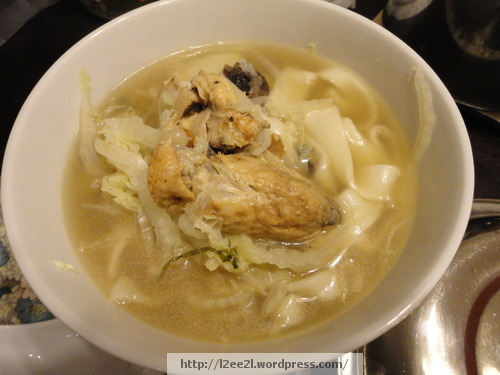 Chef’s version is Roast Duck Orange Soup Noodle. Close enough. The Cat enjoyed it. Been eating more salads for dinner lately. Getting tired of romaine lettuce. Yesterday at the farmers market a vendor was selling green papaya, already shredded. Yay! So for five dollars I picked up a bag of shredded green papaya (enough for at least three dinner sized salads), a bag of grape tomatoes, and two large limes. Not bad eh? Problem is I don’t really care for the fermented fish and vinegar dressing (too salty). No problem, just made my own variation. 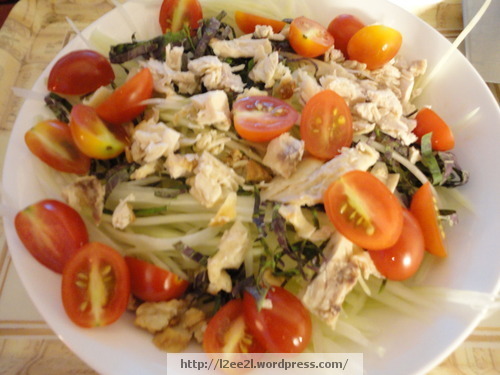 Shredded green papaya, chiffonade basil and Napa cabbage, grape tomatoes, and roasted chicken breast, dressed with salt and pepper to taste, lime juice, and toasted sesame seed oil. Much better. A couple of weeks ago I sold a small bulk purchase of candies to a cupcake maker at the farmers market, KeikiCakes. Enrobed confit orange peel, mint dark chocolate, and solid dark chocolate. The owner, Hannah, wanted the chocolates to decorate her specialty cupcakes for weddings and special occasions. This week, she made a small batch with the dark chocolate enrobed orange peel. 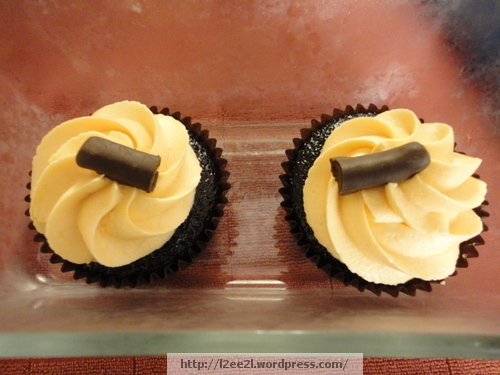 Chocolate cupcake, orange frosting, and the dark chocolate enrobed orange peel on top. Cute yeah? She was nice enough to share two, one for me and one for Chef. No worries, I’ll share mine with The Cat. Even better, Hannah’s cupcakes are vegan. Not that I’m a vegan, far from it. But I feel less guilty eating them. Hee hee. She does catering too (I’m just saying).